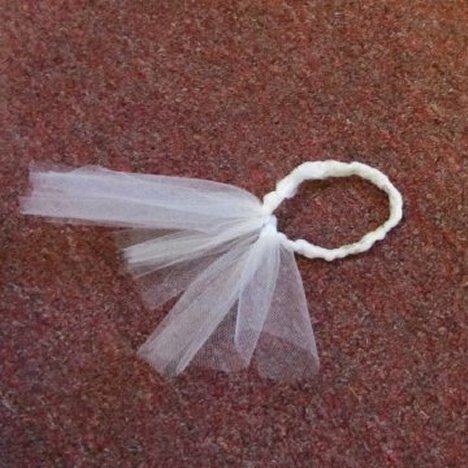 This church tulle decoration is fairly simple to create. You should now have a braided length large enough to encircle the Oasis Mini Deco. The Deco can be soaked for fresh flowers or left dry for silk flowers. You can see after braiding a length, I hold it up to see if it encircles around the foam Deco. 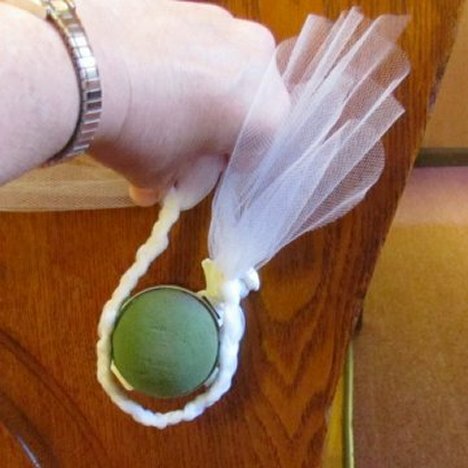 Once the measurement fits, create as many braid as needed for the number of pews you want to decorate. Tie the ends of the braid together with the short pieces of the tulle ends. 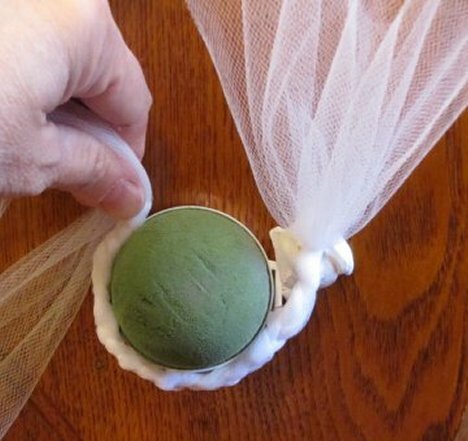 Don't worry about the short tulle ends. They blend into the final bow and are concealed. 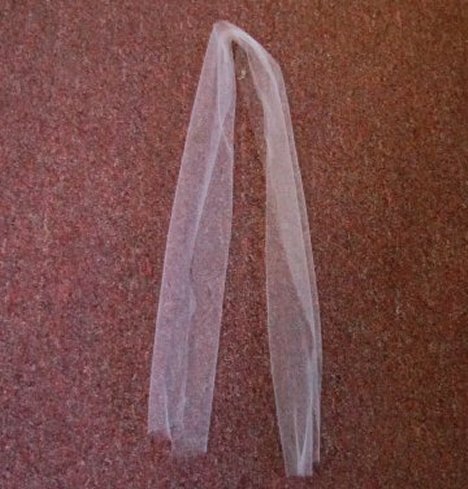 Now you will cut the tulle fabric into a long length for the tails that will fall from the bow to the floor. Cut just a little longer than you intend, since you will be trimming the bows to length after it is completely done. Roll out approximately two yards of tulle. 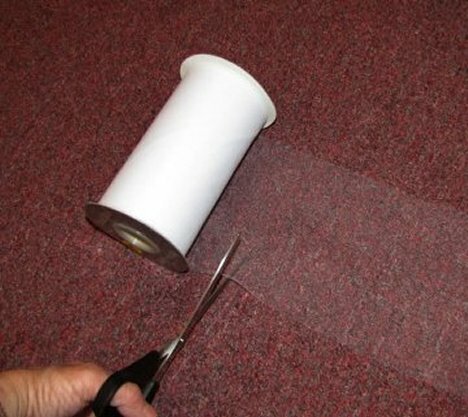 Cut the fabric cleanly with sharp shears. 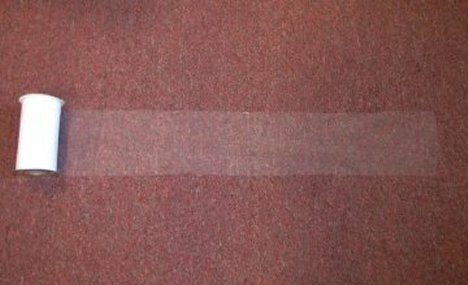 The length of the fabric will be doubled, creating two tails that will drop down from your actual pew bow. If you'd like, you can create a lot more than two tails if you'd like your bow fuller. 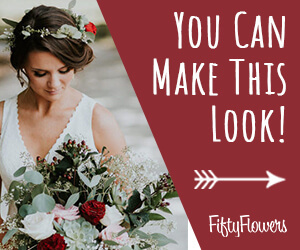 For a different look that brings in more color, considering adding colored tulle to your bow for a variegated look. Space the colors evenly around the bow for a more symmetrical look. 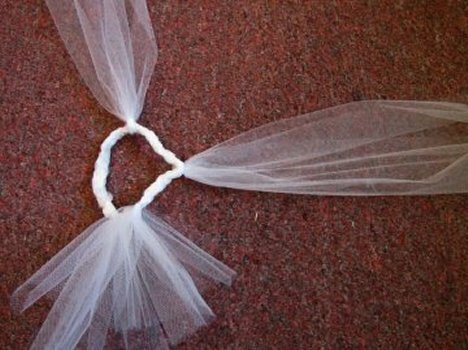 Tie the lengths of tulle to the bottom edge of the braided circle that you created in the previous step of the tutorial. 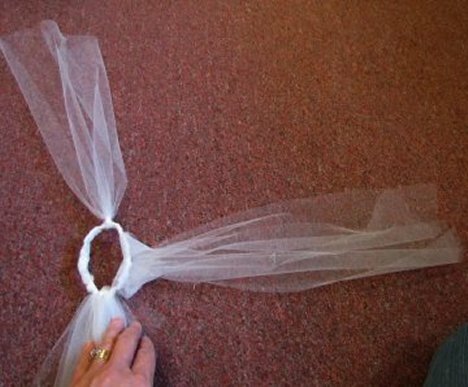 Check out the other directions for making a traditional tulle bow instead of cut ends. 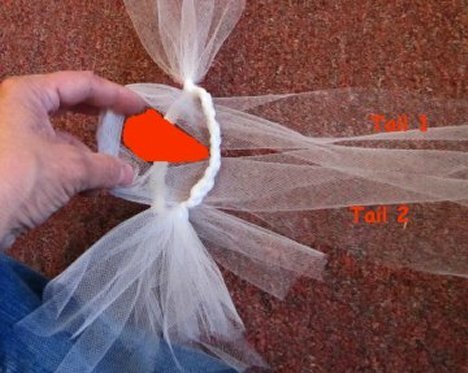 Now that you have attached the tails of the bow to the tulle circle, you'll need to cut some lengths about 12 inches long. If you need a larger bow (such as one to use on candelabras or church doors), cut the lengths longer. The longer you cut the lengths, the bigger the bow. Keep in mind that you'll use more material. 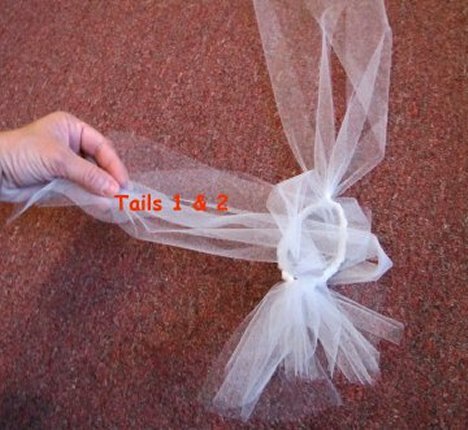 Just as you did for the tails, pull the folded end thru the braided tulle circle. 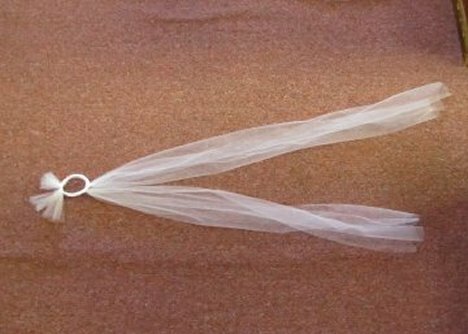 Using the short (six inch) tails, grasp both of them and pull them through the hole between the folded section and the circle. 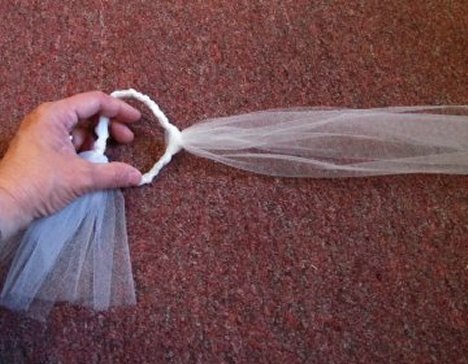 The tulle streamers should be around the same length when laid flat. if they are not even, then pull out the soft knot and reposition. 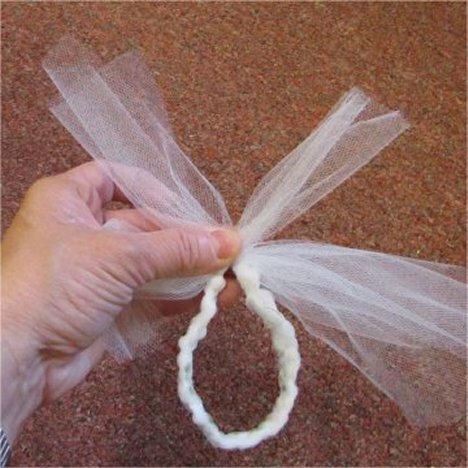 Pull on the tulle gently until the material is knotted firmly around the braided circle. Continue to cut more lengths and adding them evenly around the circle.